Love playing songs on your stringed instrument of choice but hate the process of learning them? Then you should get Capo. That’s been my standard pitch to music-loving friends for a few years, ever since I fell in love with SuperMegaUltraGroovy’s Capo, a Mac and iOS tool for quickly learning just about any song from your library. It’s not just that Capo is a formidable tool for musicians and music lovers; it’s also built with both care and simplicity in mind. The interface is sleek and clean, and you don’t have to know much about music theory or spectrograms to use the program’s tools. At the same time, there are plenty of advanced features hiding away for the folks who really care about such things. Capo’s latest updates—released simultaneously for the Mac and iOS—not only provide an even sleeker new interface on the iOS front, but they also add much-desired new features for both platforms. New in both the Mac and iOS version of Capo is iCloud sync, which allows you to store your projects in Apple’s remote storage locker rather than siloed on your device. In addition, that sync feature is compatible across devices: Start learning a Joni Mitchell tune on your iOS device, save the project to iCloud, and it immediately syncs with to your Mac (assuming you have the desktop version of Capo installed). Capo for Mac has had chord-detection options since version 3.0, but now that feature is available on Capo for iOS, too—and it’s a whammy. 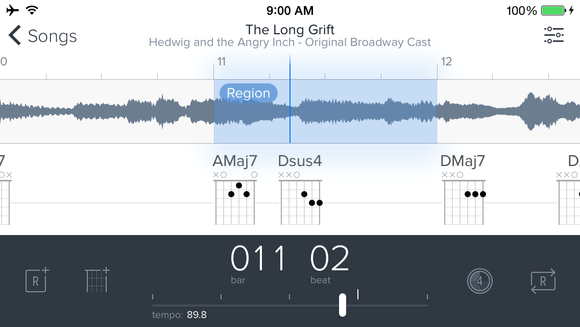 Not only does the app automatically attempt to detect chords in the songs you’re playing, but you can then adjust those chords any way you like—drag them to a better place in the song, adjust where on the fretboard you’d like to play, and even swap it for a different chord if it’s not sounding quite right. 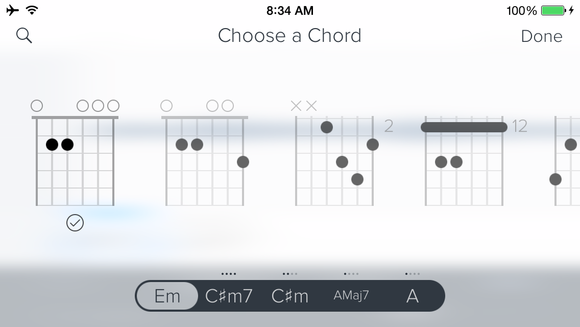 You can also manually request a chord from Capo by tapping the Add Chord button at the bottom of the screen. In previous versions of Capo for iOS, you had to manually set markers to loop certain sections of your song; now, the regions button automatically selects a section (timed to the beat of the song) nearest to your playhead. You can manually adjust this section by tapping and dragging on it, or enter loop mode by tapping and holding on the play button. The neatest thing about regions for me is that you can, for the first time on iOS, have multiple sections. With a long-tap on the Regions button, you can even have them color-coded by Region (blue), Verse (yellow), Chorus (purple), or Bridge (teal). (You can also add your own custom names.) 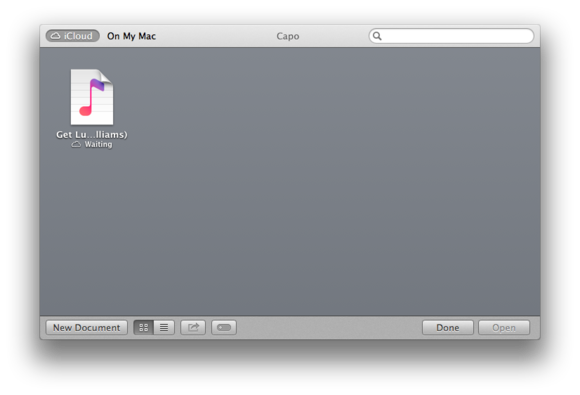 It makes organizing the bits of a song you want to learn a lot easier than fiddling around with tiny markers, and it all syncs over to Capo for Mac. Apple’s GarageBand has long offered a great count-off feature when recording, letting you have a few seconds to prep before going into the song. 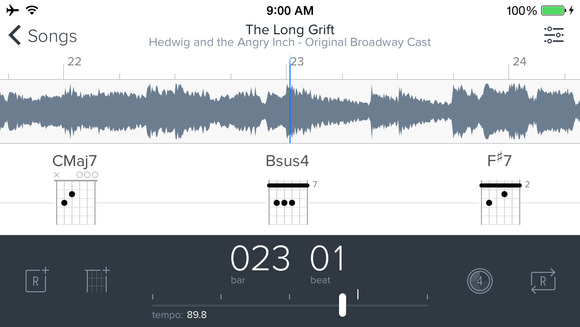 Capo for iOS gets a similar mechanism in this latest update; you can choose one, two, or four bars of count-off before your section of song will begin. You can also enable the metronome in a variety of time signatures to help stay on the beat. We’ll have full reviews of Capo 3.1 and Capo touch 2.0 soon; in the meantime, you can check both apps out on the Mac App Store and iOS store respectively for $15 (normally $30) and $5 (normally $10).